ISC WEST - LAS VEGAS, April 10, 2013, (Booth #3127) – Inovonics, the industry leader in high-performance wireless sensor networks for commercial and life safety, today launched the EchoStream EN6080 Area Control Gateway (ACG), the industry’s first PSIA compliant device that provides IP-based interoperability of leading access control, video and area control (formerly burglary and intrusion detection) systems. The EN6080 ACG enables integration, configuration and management of thousands of wireless devices, establishes interoperability between multiple physical security systems and creates a common communications platform to build customized commercial security solutions based on specific organizational requirements. The EN6080 ACG is the first area controller in the industry to offer a PSIA-enabled integration of wireless intrusion devices into a commercial security environment without the need for add-on relays or a customized serial interface. By incorporating the EN6080 ACG into a wireless network infrastructure, end-users and systems integrators have the flexibility and freedom of choice to connect existing and/or new systems into a cohesive, fully integrated commercial security environment. Common data flow and sharing between access control, wireless intrusion, video and associated analytics provides a centralized view of facilities and systems. A browser-based user interface streamlines wireless device registration and system configuration. Using the PSIA Area Control standard, data is shared between access control, wireless intrusion, video and associated analytics. For example, in an intrusion situation, if a door is opened during a burglary attempt, the fully integrated system utilizes wireless alarm information to instruct video monitoring equipment to focus in on the specific door where the event is taking place. The coordinated sharing of data within a fully integrated system essentially allows for a smarter deployment and the reduction of false alarms. With the reliability of an embedded software-based controller, adding Inovonics’ burglary and intrusion detection capabilities to any PSIA compliant application is simplified. Direct IP integration: Wireless sensors are registered through a browser-based embedded web server and incorporated into a commercial security system. EchoStream: The EN6080 ACG uses Inovonics’ dedicated, secure and fully supervised commercial mesh network and links it to a standard TCP-IP Ethernet LAN. 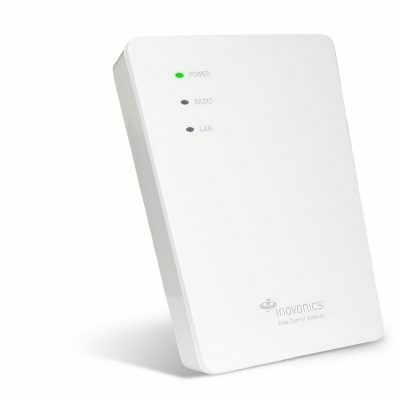 Small to large campus coverage: EN6080 ACG supports up to 3,000 wireless endpoints. The Physical Security Interoperability Alliance (PSIA) is a global consortium of physical security manufacturers and systems integrators focused on promoting interoperability of IP-enabled security devices and systems across the security ecosystem and beyond.